Oh dear – Steve Perry has become a bit shrieky and now sports a distinct burr in The Voice. 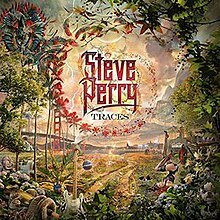 This album sounds strident to my ears, which becomes tiring; he’s doing what he always did back in Journey’s glory days, except it doesn’t really work so well anymore (not that I am a Journey fan, particularly). It worked way back when AOR was golden, and make no error, he still hits all the right notes despite sounding rough around the edges, but I would so much rather listen to “Wheel in the Sky” which to my mind is the perfect showcase for the effortless heights to which that once glorious instrument could soar. Footnote: guess I must have missed something, or been in a grumpy frame of mind when I listened. The album seems to be getting great reviews from various quarters. Still not to my taste. ^I don't either - read reviews before making my own mind up, that is, but I do look at them afterwards - for fun. No pro - just opinionated, and like to listen, but if that's a sneaky compliment, thank you. Sometimes I'm quite surprised at the different takes - this being a case in point. People seem to be lapping it up.